Or are they Hammer pants? Or clown pants? I figured in a black rayon they would be cool, swishy, slightly fancy but also very easy to wear in summer. You know, for those days when it's hot but my legs are a day away from being groomed and fit to be seen. I've found only three other mentions of this pattern in blogland. One lady who made a pair (The Mahogany Stylist) and two who, in their pattern opinion pieces, voted it the ugliest pattern released that season. 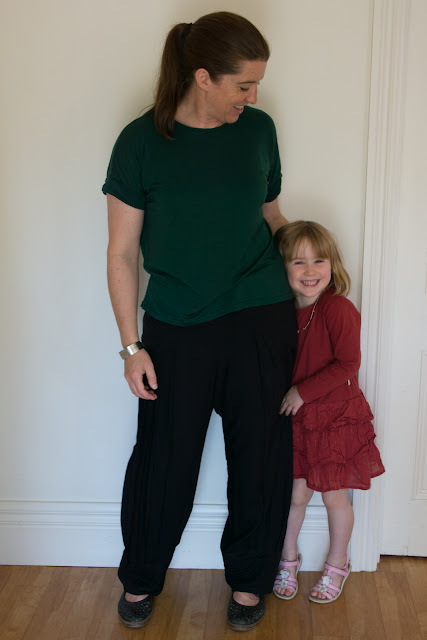 It's not easy to photograph the details of black pants, and perhaps that's a good thing... The yoke ends up being four layers on the front and two on the back and it would seem that my lining yoke is sewn on slightly short as the outer yoke is billowing a bit. 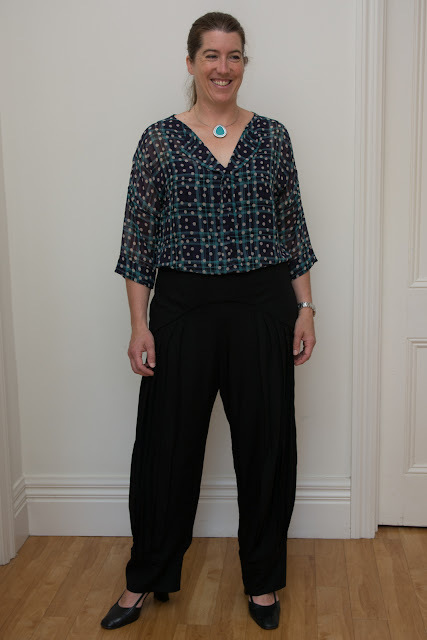 I began by hand sewing the lining yoke to the main yoke/pants seam allowances but it was late at night and I was getting a bit fed up with these slow to sew pants, so I stitched in the ditch around the yoke. Worked perfectly but perhaps I needed to worry less about the top waistband rolling out and more about the lining not pulling. 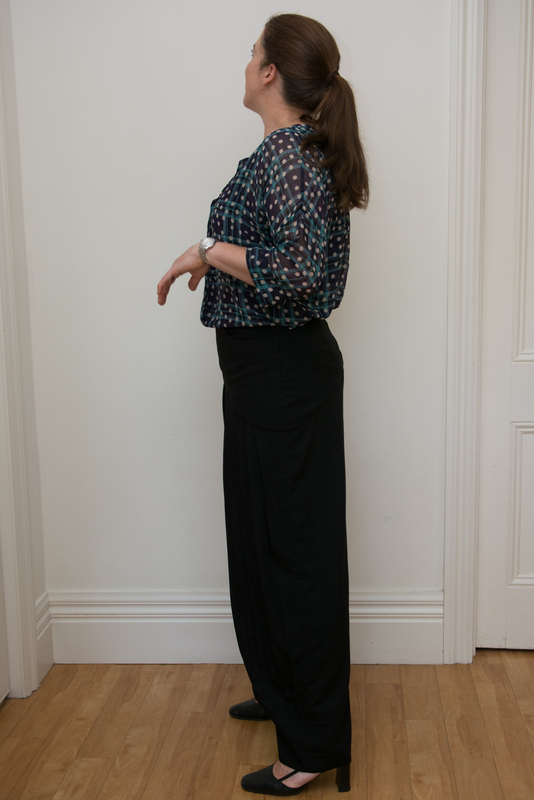 The pattern instructions suggest making a muslin of just the yoke pieces to check the fit. I did that and in calico it seemed the yoke would be good if maybe a touch on the tight side. I cut the pants out with no alterations to my size based on waits and hip measurements. I ended up bringing in the back yoke with a 3/4" sewn dart (1&1/2" reduction) at the centre back and two 1/4" darts (1/2" reduction) on each side. 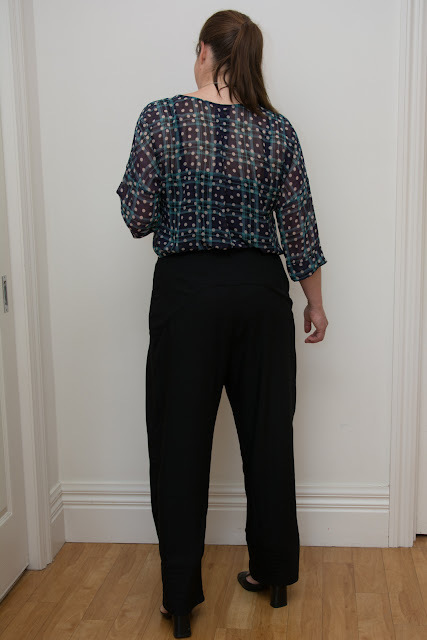 The pants are sewn on to the back yoke before it's linined and finished, so there's the opportunity to play with adding darts or adjusting the centre back seam. I made the same changes to the yoke lining then called it a night. An invisible zip on the left side closes the yoke. Under the top of the zipper is a button loop and button just to make it easier to zip closed the pants by buttoning the top edge first. Seemingly I don't know when to call it quits and go to bed, 'cause in my second night of late, late night sewing I decided I definitely did need to topstitch the cuffs at the bottom. I think it was worth the extra lost sleep. I was feeling very pleased with them and after finishing them last night I wore them for most of the day today. Maybe it was due to the change in undies, or the weather, or who knows, but today they felt even more baggy and low riding in the front. I may need to run a strip of elastic inside the top edge of the waist just to give them a bit of lift. 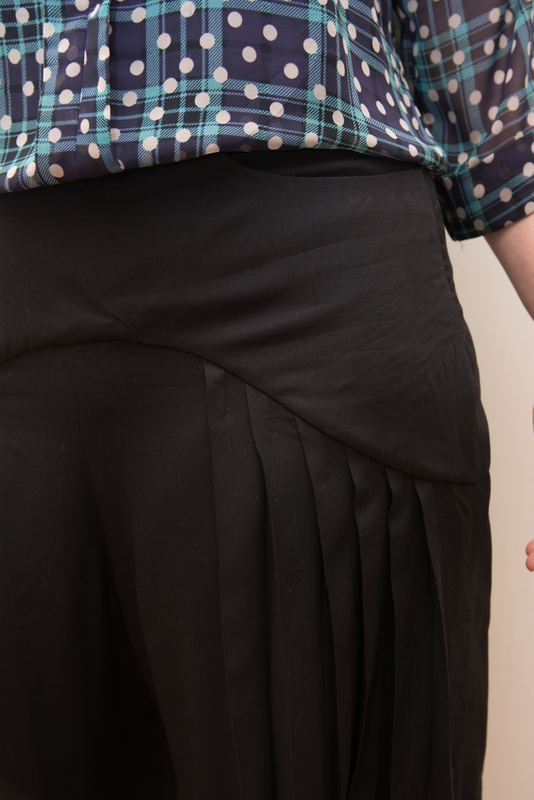 With the pleats all pressed they can certainly pass as fancy pants. Fit for a night on the town, but mostly I think I'll be wearing them (slightly) low slung, loose and easy with t-shirts and sandals. Perfect for the hot summer ahead. In Xmas sewing support news I've finished all my gift sewing. I've two projects still to share here but there's a possibility of the recipients seeing a blog post, so the blog will wait until after Christmas. I hope you all have a wonderful time. I'll be lounging in my pants! SO glad to see a real person made this pattern, and they look awesome! No clowns in sight... just an uber comfy pair of black dacks! They are comfy. Although I'll need to run some elastic on the inside of the waistband as I found myself sticking my tummy out to keep them up. not a good look! I love that you blogged about how it was voted the ugliest pattern release! haha! That's so awesome! They look great on you! These look very comfortable but gee there is a lot of fabric involved. Oh there sure is. My fabric was narrow so I bought extra. At first I thought I'd have leftovers but I had to keep going back and cutting yet another front or back yoke. I simply hadn't believed the cutting layout as to how many layers were required. I'm sure it could be constructed differently and less layers used. The only benefit is that there's no pocket outline, which would bug me if it was a standard pocket bag and showed through.